Craig Davidson introduces Cataract City with a nine-page prologue that sketches the present time for his novel. Duncan Diggs is about to leave the Kingston Penitentiary after serving eight years. He is being met by Owen Stuckey for the four-hour drive back to Niagara Falls, the Cataract City of the title. The two were childhood friends. Owen also happened to be the guy who put Dunk in prison — when they hit adulthood, the two chose different paths when it came to respecting the law. Having set that in place, the author returns to the past. Cataract City tells its story in four sections narrated by either Dunk or Owen — three visiting earlier times to bring the story up to the present, the fourth picks it up where the prologue leaves off. Those sections feature a similar structure, so I am going to concentrate on the first in this review. In each, Davidson spends a fair bit of time carefully putting in place the background and elements of the story that Dunk and Owen face at that point. When that is complete, also in each section, he sends the pair into a dramatic episode that is relentlessly bleak, masculine and violent — each of the four is the literary version of a beautiful summer day giving way to a vicious thunderstorm that refuses to stop. Before we learn much about Dunk and Owen as pre-teens however, Davidson uses Owen’s words to introduce a third “character” that will be as important as the two boys/men: the city of Niagara Falls itself. Most of the world knows that city for its magnificent waterfall. North American residents of a certain age (say mine) also remember it as a Honeymoon Capital for the lower classes — cheap, kitschy motels and even cheaper, kitschier tourist attractions and shops. When that market disappeared, Niagara Falls recast itself as a Canadian casino capital aimed at American gamblers; the irony of a community blessed with one of the world’s natural wonders choosing to attract people with windowless, neon-lit caverns being overlooked. Alas, with the advent of American Indian casinos across the border, that rebirth has also now run its course. As a kid, I found it hard to get a grip on my hometown’s place in the world. What could I compare it to? New York, Paris, Rome? It wasn’t even a dot on the globe. The nearest city, Toronto, was just a hazy smear across Lake Ontario, downtown skyscrapers like values on a bar graph. I figured most places must be like where I lived: dominated by rowhouses with tarpaper roofs, squat apartment blocks painted the colour of boiled meat, rusted playgrounds, butcher shops and cramped corner stores where you could buy loose cigarettes for a dime apiece. My father worked at the Nabisco factory on Grand Avenue. The Bisk, as it was known. If you grew up in Cataract City and earned a university degree, chances are you left town. If you grew up in Cataract City and managed to finish high school, chances are you took a job at the dry docks, Redpath Sugar, the General Motors plant in St. Catharines or the Bisk. Plenty of the jobs were simple enough that any half-competent person could master them by the end of their first shift. One of my schoolmates’ dads filled sacks of iced tea mix. Another drilled holes in ignition-collar locks. The only question was whether you could do that same task eight hours a day for the next forty years. The first seven years of my life, my father worked on the Nilla Wafers line. I don’t know what he did beyond that. (…) Dunk’s father worked at the Bisk, too. Chips Ahoy line. Our dads carried the smell of their lines back home with them. It became a forever quality of their clothes. It crept under their skin and perfumed the sweat coming from their pores. I used to keep score at the Bisk company’s softball games; after a while I knew the batting order by smell alone: first up was Triscuits, second was Fig Newtons, third was Cheese Nips. The mighty Nutter Butter batted cleanup. Davidson is equally good at setting up the story of Dunk and Owen. Both were young misfits, but they found each other when they were 10. Owen was getting beat up by Clyde Hillicker, who outweighed him by about 40 pounds. Clyde was doing his imitation of pro wrestler Bruiser Mahoney; Dunk (who had never spoken to Owen before) stepped in to rescue him. As readers, we have actually had a reference to Bruiser before this — when Dunk was leaving Kingston Pen he checked his shoebox of personal treasures, one of which is a picture of Dunk, Owen and Bruiser, with Bruiser’s autograph. The ten-year-old boys were wrestling fans, having convinced their fathers to take them to the Saturday night matches and Bruiser is their hero. We ran down the aisle as Bruiser Mahoney’s music began: John Henry was a Steel-Driving’ Man. The crowd rose to a thunderous roar as Bruiser Mahoney burst through a rainbow of sizzling fireworks. He ran with a high-kneed and almost clumsy gait, robe billowing off his heels. His face was set in an expression of controlled wrath — of joy. You could imagine a Spartan warrior running into battle with that same teeth-gritted, cockeyed look. With Owen and Dunk’s father obviously headed to the nick, at least for a few hours, Bruiser “rescues” the boys and takes them into the wilderness of the Niagara Peninsula forest. Unfortunately, Bruiser has mistaken a bottle of drugs that produce hallucinations for his pain-killers — the “rescue” turns into three-days of survivalist hell that will eventually lead to his death and apparently endless wandering in the freezing cold for the boys. The delightful set-up of section one takes up 41 pages, the wandering in the woods 85. The lyricism of the first part disappears in a relentless, repetitive description of the threats of the frozen wilderness — frankly, after the first 15 of those 85, I was just wanting it be over. Indeed, had this novel not been on the Giller longlist, I would have abandoned it by page 100. I didn’t, and in the final analysis, I am glad that I went on. Davidson’s set up portions in the next three sections are every bit as good as the first one was — alas, the much longer “dramatic” sections are every bit as gruelling. Dog fighting, no-rules bare-knuckle human fighting and a cross-border cigarette smuggling episode that goes awry (that’s what led to Dunk’s conviction) were just a few of the things that came along to test my reading patience. I can forgive the author for insisting that memories of working-class reality also, at least in his story, demand disturbing criminal-class realism — the romanticism of bringing back my own childhood needed to be offset with reminders that some of my classmates ended up following that criminal path. Still, I wish Davidson had been more economical with his prose when it came to those reminders. I can also understand why the three authors who comprise this year’s Giller Jury put this book on the shortlist. The contrast that Davidson presents between the two parts of the story both in content and tone — in all four sections — represents a substantial writerly achievement. I confess it disturbed and upset me during the reading; I will be quite interested in how it eventually lands in memory over time. 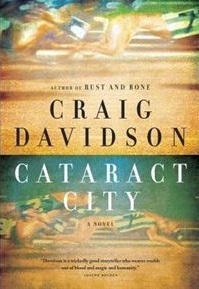 Cataract City may end up being quite a memorable novel (I am reminded of Patrick Lane’s Red Dog, Red Dog which has some similar themes, including despicable dog-fighting); on the other hand, it could end up being quite a forgettable one. Only time will tell.